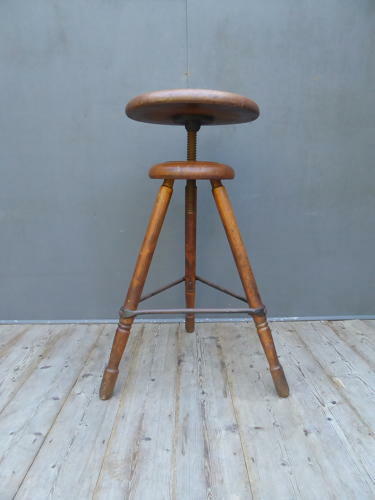 A beautiful large early antique industrial work stool. A fantastic piece of early indutrial design with a generous, thick concave seat, beautifully turned legs and a cast iron stretcher & height adjustable swivel mechanism. The age related patina is perfect & the delightfully unneccacary attention to detail sets this one apart from the competition, one of the best industrial stools I've come across. Wear commensurate with age, totally untouched original condition yet clean & ready to use. An exceptional example. Height ranges from 66cm to 83cm & the seat is 33cm across.